Lake Vancouver is a small fresh water lake and wetland within a City of Albany Nature Reserve, located on the Vancouver Peninsula, about 200 m west of Goode Beach on Frenchman Bay. Because of its pristine condition and unique position so close to the ocean, the Lake Vancouver wetland is listed in the South Coast Significant Wetlands Database and is currently being used as a case study to help determine wetland buffer zone guidelines for Western Australia. The wetland is currently in remarkably good condition because of the surrounding buffer zone of thick, natural vegetation and the lake connection to shallow, fresh groundwater. Lake water quality is good (but not classified as potable) and the nutrient content (phosphorous and nitrogen) of the water is relatively low. Water levels in the Lake Vancouver wetland vary seasonally and depend on rainfall, surface runoff, and groundwater levels. The infiltration of rainfall and surface runoff into the ground has formed a shallow lens of fresh groundwater, which supports the biota of the wetland and floats on denser, saline groundwater at depth (see cross-section). During the summer (high evaporation and little rainfall), lake levels decline, but are maintained by groundwater inflows from the shallow lens. During winter, rainfall and runoff raise lake levels and recharge the fresh groundwater lens. Any future residential development around Lake Vancouver needs to be limited, because this fresh water wetland system is very fragile and needs careful management. Any significant reduction in the size of the fresh groundwater lens (for example, by pumping groundwater near the lake or by pumping water from the lake) could result in salinisation of the wetland by the upward movement of the underlying saline groundwater. Until 2012, public access to any part of the lake and wetland was very limited due to the thick fringing vegetation and swampy, waterlogged conditions during the winter. In many ways, this maintained the pristine character of the wetlands. In order to provide public access to Lake Vancouver, not only for bird watchers but also for the public, the Frenchman bay Association sought to get the approvals from key stakeholders to construct a bird hide. 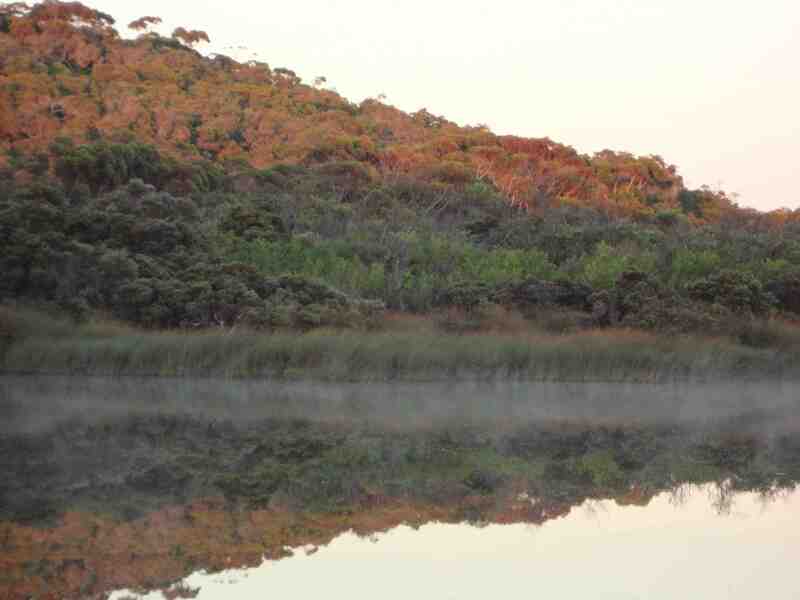 It was critically important that the hide had a minimal environmental impact on the lake and its surrounding vegetation and advice was sought from City of Albany officers, the Department of Water, and from the Noongar community. The path providing access was carefully chosen, and all steps were taken to make sure that the the vegetation and the water quality were preserved. For example, the stumps on which the bird hide rests are made of jarrah timbers and not the cheaper, treated pine. The Greenskills team lavished a great deal of attention to all the details. The funding of the construction was made possible by a Natural Resource Management grant; City of Albany funding; significant assistance from City of Albany Reserve Officers; and volunteer labour from the FBA. 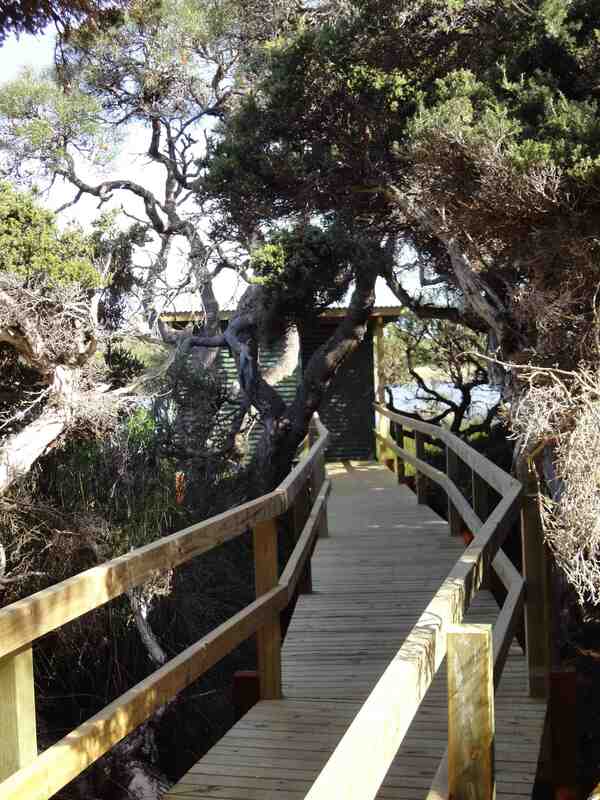 The bird hide was officially opened by the Mayor of Albany, Dennis Wellington, in November 2012. Because Lake Vancouver is fresh water it is not filled with algae and does not support a large population of water birds, though various species fly in from time to time. The ‘signature’ inhabitants are Musk Ducks and their courting rituals are a joy to observe in Spring. The plaintive call of the male Musk Duck can be heard for much of the year by residents. The bird hide is also a contemplative place to be and at dawn or dusk the light and shadows show off Lake Vancouver to those who are able to watch from the bird hide. The bird hide is accessible from La Perouse Road in Goode Beach, by following the directional signage at the intersection of Vancouver and Frenchman Bay Roads and along La Perouse Road.